At this year’s United State of Women Summit in Los Angeles, She Should Run partnered with Bossed Up and Platform Women to train hundreds of women on how to get clear on why they want to lead. Our very own Jenn Addison was there to help attendees clarify their leadership vision during the “Lead Like a Boss” panel. After all, figuring out your “why” is a critical step in getting people to believe in your vision for the world. After the United State of Women Summit I had a serious hangover. No, not that kind of hangover. They don’t call California the Golden State for nothing. The 2018 United State of Women Summit brought together movement leaders, trailblazers, and change makers from across sectors, backgrounds, and all walks of life. Everywhere I looked, each panel I attended, the sheer power of women was palpable, undeniable. 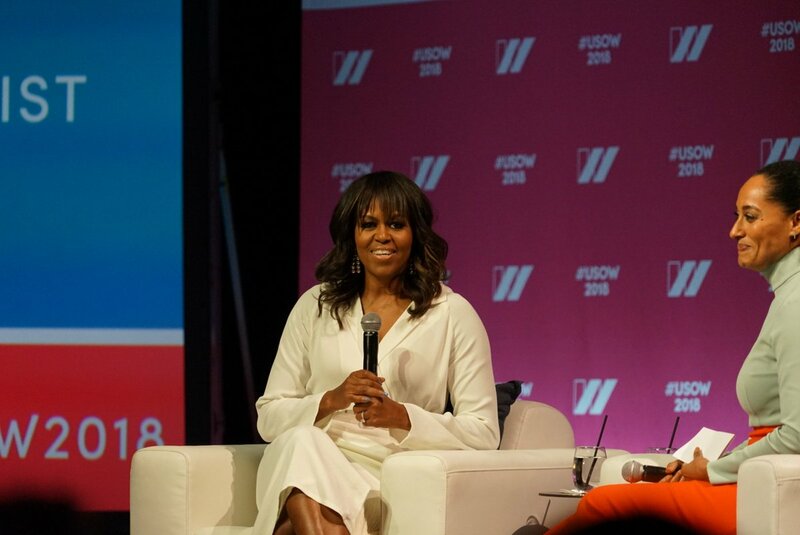 The leaders present at the Shrine Auditorium spanned generations, from Marley Dias of #1000BlackGirlBooks to Michelle Obama, and summit goers were left with no doubt that both the present and the future are female. Yes, when women come together, we are unstoppable, but what happens after we walk away from weekends like this? There is no shortage of inspiration when in the same room as women leaders like Tarana Burke, Tracee Ellis Ross, Jess Weiner, Dolores Huerta, or Rep. Ilhan Omar—but days later, if you’re like me, you might find an inspiration hangover creeping in. As you snap back to reality and dive back into the daily work of tackling the biggest, most challenging issues facing our communities, we can begin to wonder, how will we ever get there? One woman answered, “When you can do the right thing even when no one is looking and no credit is given.” So true! Some of us may never win prestigious awards for our work, but all of us will make a positive impact on the world. Say your fears out loud so that you can begin to move forward and eliminate the barriers standing between you and your ability to own your power power. During the cultivate your leadership training, I shared that I had a fear of public speaking. Once my “secret” was out, I felt like I had nothing to hide and was able to move forward and deliver She Should Run’s very important message that we need more women to lead. We are all working to tackle major problems, from achieving women’s equal representation to ending homelessness. Keep your eye on the prize but know that you aren’t going to solve the problem tomorrow, this week, or this year—don’t be afraid to set big, bold goals like getting 250,000 women to run for office by 2030 #250Kby2030. Support each other. At the training, a few women shared what issues they care about the most and it became clear that, while the reasons why we’re passionate about certain issues may vary, our end goals—like ending homelessness—are shared. Events like the United State of Women Summit are a great chance to form partnerships and join forces with women from other communities. Remember that leadership is a journey. There is no one path to leadership and there is no one type of leader. Stay grounded in your leadership by getting clear on your “why” and reminding yourself of that “why” in moments where you feel overwhelmed or lost. Take care of yourself. During one panel, “It’s A Marathon Not A Sprint: What Women Need To Keep Fighting For Change,” T. Morgan Dixon founder of Girl Trek, reminded the audience that self-care is a crucial part of our work. As we continue to push for change, as we fight to make ourselves seen and our voices heard, and even after we come together for events like the United State of Women Summit, we need to take care of ourselves. We’re in this fight for a more representative, equal, and effective democracy for the long haul and we need to be as fully present as possible every step of the way.